Last weekend I went to Knit Fit, where I attended some evening events, hung out in the marketplace, and even taught a class on sock heels and toes. It was a blast! Friday night I went to Mary Scott Huff’s lecture Everything I Need to Know, I Learned From Knitting which was funny and sweet and pretty much just like her. She is always so much fun! Saturday I spent some time in my friend’s booth – three fates yarns, and hanging around the marketplace. That evening I attended the Game Knitting movie night with Lee Meredith. We watched Singles (so Seattle, so grunge!) and knit along. I started a cowl with random eyelets, but I’m not sure if I like it as much as last year’s cowl. Sunday I taught a sock class. There was even a door with a sign for my class! Yes, that is me being a big dork about my sign. 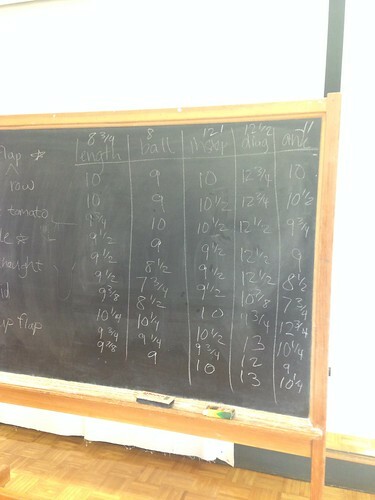 The class was a lot of fun! I was worried my students wouldn’t be very enthusiastic about participating in the activities (like measuring our feet and discussing the differences in measurement and how they affect sock fit) but everyone was ready and willing to participate, which made the class even better than I expected. 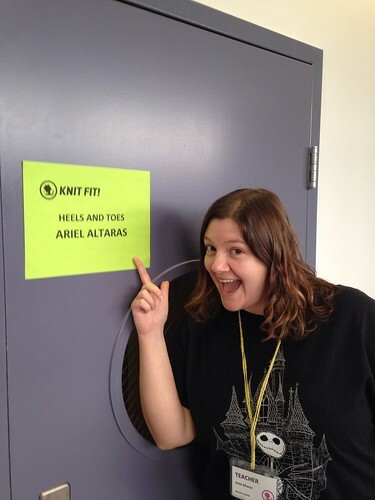 I had a great time both teaching and attending Knit Fit this year, and I hope to be able to do one or both again next year. Also, I am a big loser and didn’t take any pictures of the marketplace, but I’m sure others did.